We didn’t get a whole lot of snow, but I spent about an hour and a half shoveling yesterday morning. It was hard on my back, but I was feeling so grateful for my new knees! The cold air was invigorating and the snow made me feel all sorts of festive for the holidays coming up. 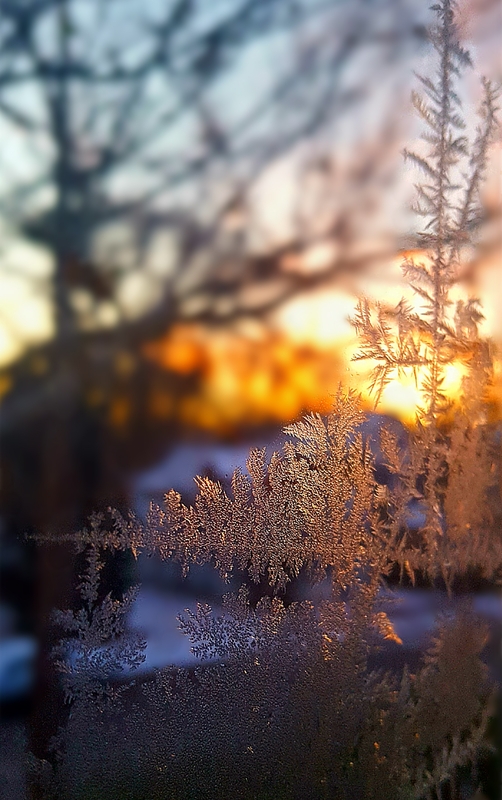 Anyways, I was delighted to find some pretty frost on my window as I watched the sun come up this morning, and I look forward to seeing more of it. I know, I know… most people dread winter, but there truly is so much beauty to be found if we look for it. And it’s just so dang cozy! This entry was posted in Nature, Photography, Poetry, Winter and tagged Frost, Nature, Photography, Poetry, weather, winter. Bookmark the permalink. I got cold here overnight–in the 40’s! No frost but it still feels great! I so enjoy your frosted window photos. Beautiful image Julie! It seems early for snow. It just started to snow in Ajax Ontario, looks like light snow. I agree that fall should have lasted longer. Your photo is truly beautiful. Ohhhhh I am determined to get ONE more outing for Fall in my schedule. I refuse to bow down to Mr. Winter yet. NO! It is just too early, darn it. We’ve yet to have Indian Summer! Winter’s cozy beauty? Right. At my age, only if I’m looking through a frosted pane, though I do remember a time when–mufflered, gloved-up and heavily shod–I could see beauty almost everywhere when it snowed, and in the bones of trees or outlines of the hills when it didnt. New grandchild, new knees, new snow– so much joy in small things. Im reminded to be grateful too for mine. It’s always the small and simple things that bring me joy. 🙂 Wishing you joy today, Albert! The first one always has special meaning…. and a reminder to turn the heating up❣️Duly done in our PA neck of the woods! New grandson??!! What did I miss?